Septimus: A First Latin Reader, by R. L. Chambers and K. D. Robinson. My neighbour Pat has recently given me her Latin textbook, a 1950s reprint of a beautiful 1930s classic, which may actually have been the forerunner of a revolution in Latin textbooks. 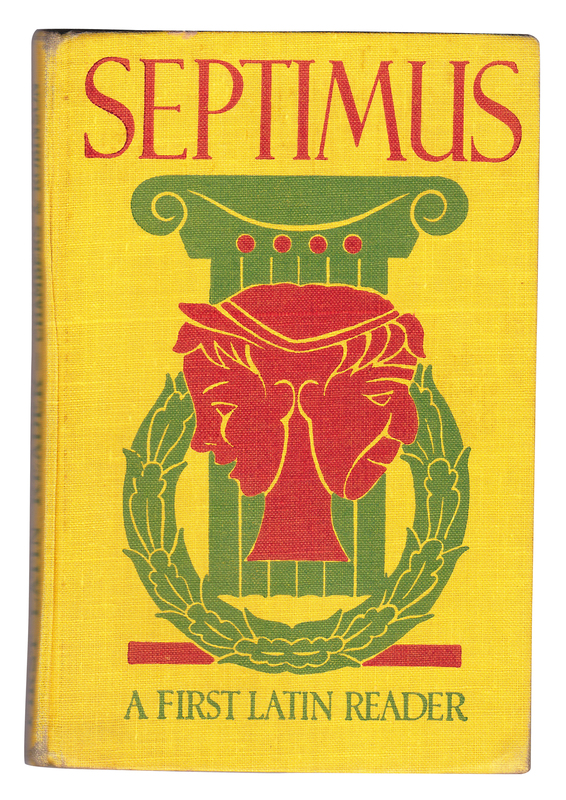 First published in 1936, it is titled Septimus, not because it is the seventh book in a series, but for its main character, a young British schoolboy named Septimus. When I first received the book, it was wrapped in the kind of thin brown paper that old parcels used to be covered in. I suspected that the greasy, battered brown paper was hiding something beautiful underneath, and on removing the paper I was not disappointed. As you can see above, the original cover design is perfectly preserved in yellow, green and red. Posted in Ancient Language and tagged Cambridge Latin Course, classroom, illustration, language, Latin, Latin reader, Latin textbooks, Septimus, textbook, vintage. Bookmark the permalink.